logging4bb is a background app and will be started automatically. and/or to a local SQLite database. the goal of this project is to have an easy to use logging framework. 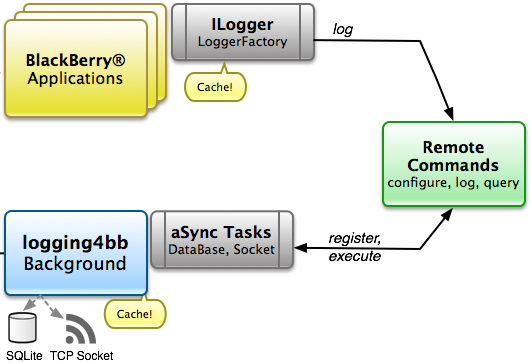 logging4bb is easy to use: run the logger as a system module in the background. logging4bb registers some remote commands. 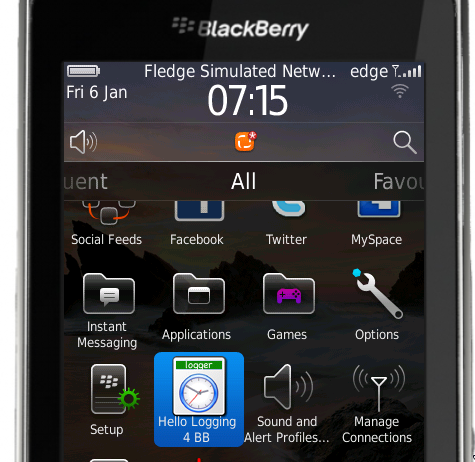 this enables you to use the logger from as many BlackBerry Apps as you like. 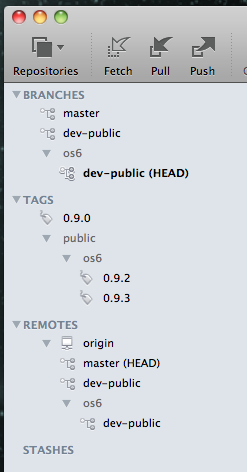 … change same parameters in the LoggerFactory (marked as TODO) and it works. if the background app isn’t installed on the BlackBerry there’s a fallback to sys-out logging. So its possible only to install the logger if you need it or while testing. Hint: you can access all sessions on demand from BlackBerry DevCon here. Why do we prefer Bitbucket ? We also need some private Repositories and Bitbucket allows unlimited for free. Also Bitbucket supports hg (Mercurial) and git and because we also have some hg repositories Bitbucket is a single place where we can store all. 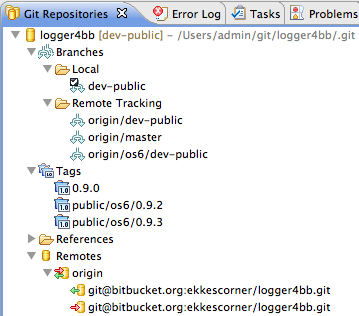 logging4bb uses Git to manage different platforms in one single repository. please take a look at this blog I wrote about Git and mobile development describing the structure of our GIT repositories to understand it. logging4bb isn’t running out of the box, because we’re using BIS. RIM doesn’t allow us to publish the connection string, so you have to edit this. inside Logging4BBApp the connection string is “??????????? ?” – please replace this with the BIS connection string. best is to create a local branch for this. if you don’t have BIS, then you can also use deviceside=true for a direct socket connection – but we only support the BIS version out of the box because all our Apps run on BIS. We’re using the Eclipse Public License (EPL) for OSS projects. EPL lets you much freedom and can be combined easy with Apache Licenses used by BlackBerry OSS projects at Github. If launching logging4bb together with the example project don’t forget to start MDS with the simulator and to simulate a SD Card. Hint: logging4bb is a system module automatically running in the background without an icon on your homescreen. Checkout the branch you need into your workspace, per ex. os6/dev-public. Use the tool you like: the commandline, EGit or (on OSX) Tower. Checkout the branch and import project into your workaspace. Originally Lilith is used as a LogMonitor for SLF4J / LogBack. But as you probably know LogBack doesn’t run on BlackBerry OS. logging4bb uses a trick and sends Log Messages in the same format to Lilith as this would be done using an Appender for Lilith from Java SE applications. 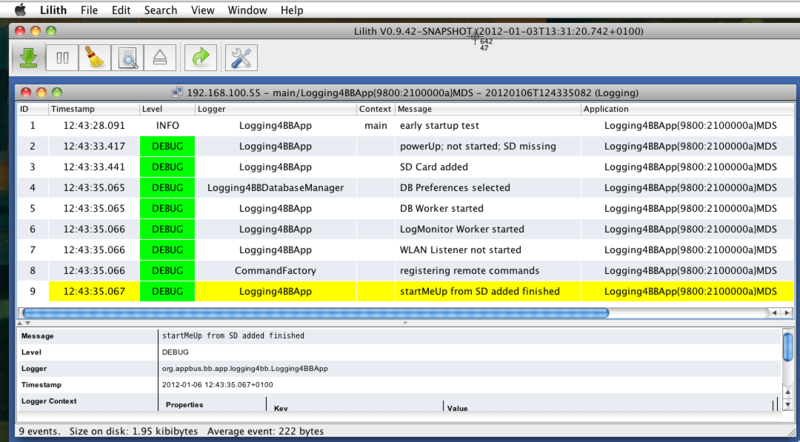 What’s really great if you’re testing Client / Server applications – you can monitor the Logging using Lilith and watch server-logs side-by-side with logs from BlackBerry devices or Simulator. Lilith isn’t a real Server: you don’t get back any acknowledges – you only send out a stream to the socket connection. Then it depends from the transport protocol if you know if Lilith is really waiting for events: using a direct TCP connection, you’ll get feedback that the connection is closed. To avoid that Lilith thinks your Connection is closed, we’ve implemented a heartbeat protocol sending a Ping Logmessage to Lilith. This is an empty Log Message without a timestamp – so Lilith ignores it but stays live. If you’re starting logging4bb the first time, the SQLite will be created automatically ind the preferences will be initialized from the values stored in your Logging4BBApp. 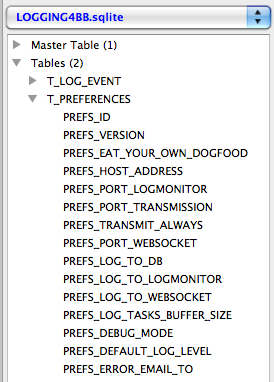 You can change the stored preferences using a tool to manage the SQLite or using a remote command. there are examples in the hello-logging4bb project how to change some values, so it’s possible to change the behaviour if logging should be stopped or go into DB or to Lilith or both. If logging4bb was started and a DB already exists, then the stored preferences are used instead of the Constants of Logging4BBApp. Hint: if storing events into the local SQLite DB it’s up to you to manage the DB: copy to desktop or delete if not used anymore. 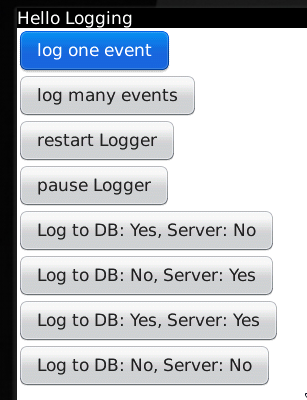 The upcoming Logging4bb Manager will provide a UI and tools for this. If you don’t want to build and deploy your own logging4bb APP or you don’t have access to a BIS Connection String, soon there will be the app available from AppWorld as a product using BIS. 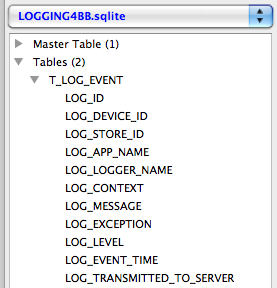 Also it will be bundled with a LogManager APP providing a UI to manage the Logging DB preferences or to take a look at the logged events from SQLite DB.